The french terry fabric features a soft hand with a smooth face for decorating. 60% cotton/40% polyester, 5.3 ounce, midweight soft fench terry pullover. 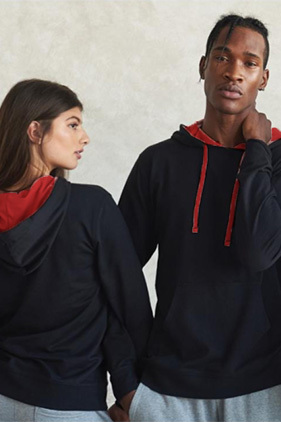 Contrast and matching jersey lined hood. Flat drawcord. Metal eyelets. 1x1 ribbing at cuffs and waistband. Front pouch pocket. Tear-away label.